There's one thing that comes with every Rotary lift. Why does Rotary Lift sell more professional lifts than anyone else in the world? The answer can be summed up in one word. You can trust the fact that no brand of lift performs better or more reliably than Rotary Lift, helping to ensure the lowest total cost of ownership while protecting your profit stream. You can trust that every Rotary lift reflects the commitment to innovation that has made Rotary the lift leader. You can trust that Rotary Lift will continue to lead the industry in the manufacturing of lifts in an ISO9001-certified facility, with each lift designed to meet applicable ANSI standards. That they're fully supported by the industry's most extensive network of factory-trained professionals for specification, installation, parts and service. And that Rotary lifts are engineered, designed, tested and certified for years of dependable income production. When buying your next automotive lift, go beyond anyone's promises. Consider the answers to all of the questions outlined here before you decide. By thoroughly exploring your purchase, you're making a decision based on a lift's total cost of ownership. It's the kind of investment that pays for itself quickly, and then gives a lift to your bottom line - every day you do business. 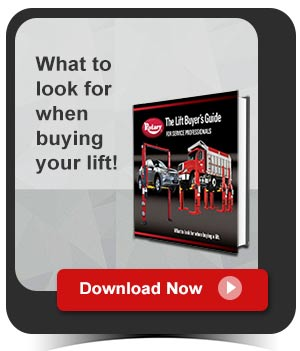 "The Lift Buyer's Guide," what to look for when buying your lift. Click here to download.